ENERMAX is pleased to announce the new flagship tower series: Fulmo GT and Fulmo. They are the fusion of performance and style, with exceptional compatibility and ease-of-use design. 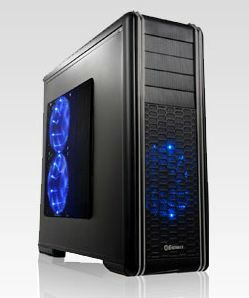 This series comes in both full-tower and mid-tower sizes, each providing different configurations. The Fulmo and Fulmo GT meet different demands from advance users to performance craving enthusiasts. Fulmo GT is a HPTX MB-supported full-tower case. Its jaw-dropping volume allows massive storage of up to 14 devices, dual PSU mounts, and quad VGA cards with 425mm /16.73 inches in depth with astonishing support for 15 to 20 fans. Newly-adopted 18cm Vegas LED fans with multi-lighting keeps you delighted by its nice effects. An integrated fan speed knob allows total control of three fans to provide dynamic thermal solution for systems under different loads. In addition, there are more than sufficient USB 3.0 ports with one external SATA dock that makes massive data transfers in no time. Whether you are looking for a robust workstation or want to build an ice fortress for your hard-core gaming rig, Fulmo GT is definitely your answer! Though packed in mid-tower size, there is no compromise on its performance. Fulmo proposes a real novel solution for space restrictions, which allows up to 410mm/16.14 inches of clearance for VGA card installations, and saves struggling for inches or trade-off between HDD devices. 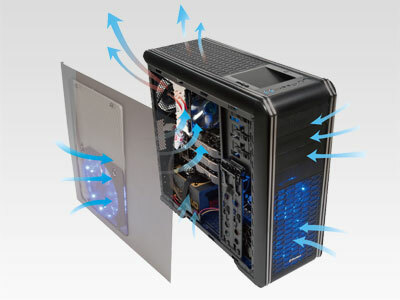 In addition, the Fulmo has upgradability for triple VGA cards and a total of 10 to 14 fan mounts, makes it the ideal choice to maintain pleasant temperature while keeping extreme visual experience. Sharing the same design attributes with Fulmo GT, the Fulmo inherits the fan LED control, top USB 3.0 interface, and external SATA dock. All in all, Fulmo surpasses rivals both functionally and aesthetically.